The Nikon Keymission 360 is one of the recently-released 360 cameras. Nikon Rumors (no relationship to 360 Rumors) is claiming that Nikon Keymission 360 is discontinued, shortly Nikon announced that Nikon 1 mirrorless cameras would be discontinued. No one in the 360 community would be surprised. The Keymission 360 gained notoriety for its app, which was difficult to connect with. Nonetheless, I liked that it was convenient to use because photos and videos were stitched in-camera. In terms of image quality, I liked its dynamic range and its sharpness in the center of the lens, but the image quickly deteriorated as you moved closer to the stitch line. Here was my review. 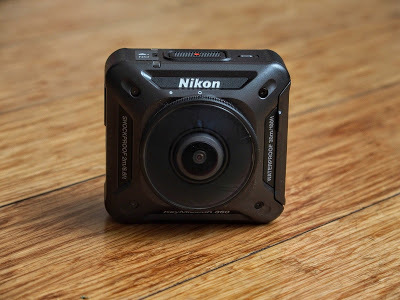 Ultimately, the $499 Nikon Keymission 360 was surpassed by many other 360 cameras that had a lower price, higher image quality, and most importantly, stabilization, such as the $299 Insta360 One or the $250 Xiaomi Mi Sphere (reviewed here). Thanks to Frederic Sidler for bringing this to my attention! I got mine on second hand at 180$ and when you know how to use it, it’s a bang for your buck. The quality is not bad, the lens can be replaced if scratched (wink wink GoPro), it can go underwater without a case, and the app works pretty normally with my Android phone (not at all with my iPad, but I knew what I was signing for). Too bad Nikon didn’t update it like Insta360, Rylo, Xiaomi or even Samsung are updating their cameras. I got one on sale for about $200.00 (Australian) funny enough didn’t have a single connection issue with the APP. I actually think i got myself a bargain! the camera is simple and definitely got me interested in doing more 360 type photos and videos. Awesome! Yes the keymission is not bad in my opinion. Good for you! Mark your calendars! Exciting 360 camera announcement on July 19!